Tim & Tina's new home building blog - redevelopment in Australia! 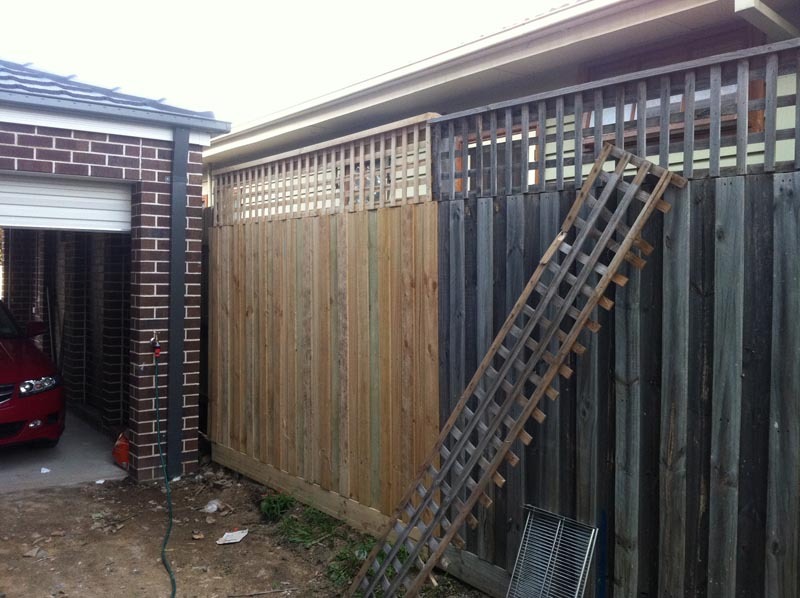 : Fence replaced, telstra connection? Our long-suffering neighbours will be glad to find the fence replaced - because the garage was being built 150mm inside our boundary, the existing old fence had to be pulled down for the slab & bricking to be done in the area. The new section of fence is about 10m long, and has a mini retaining wall section in our side of the boundary, as there was about 30cm of site cut in the garage slab area. On the left side of the pic, you can see the rear roller door, plus an extra water tap added. The plan is to concrete this rear section all the way to the back of the house, to allow for extra car parking/washing plus a shed. And I've been puzzling over this for a while... probably want to set up an unlimited ADSL2+ connection to the house, and I'm not even sure we have a phone line connected to the exchange. 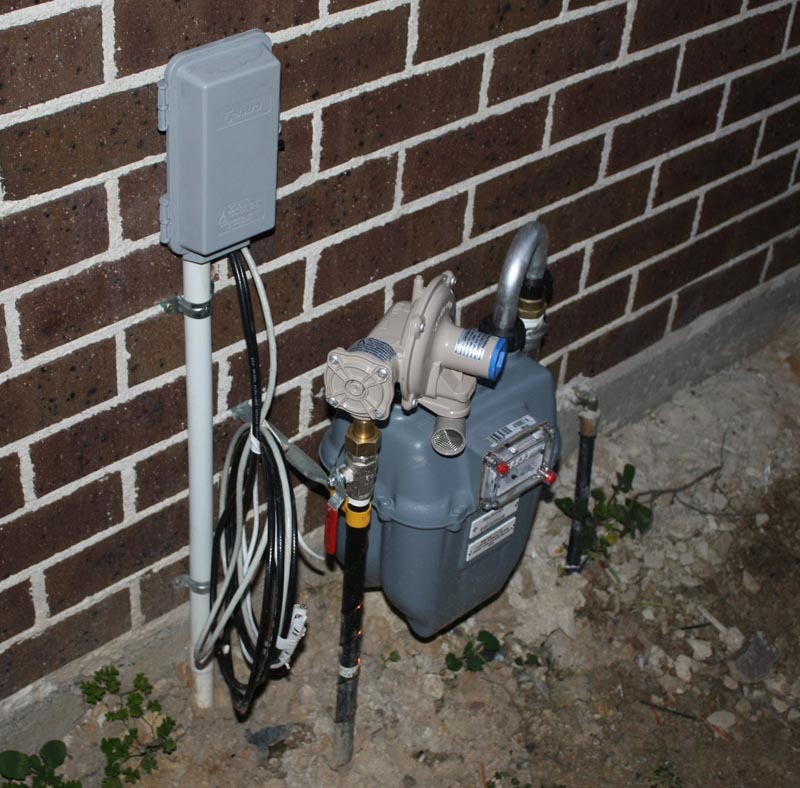 We have the standard 2 internal phone points, and we do have a Telstra box mounted near our gas meter with a conduit running into it... plus all these extra wires hanging out the side of the house. I know one of the black cables is a standard coax lead-in for cable internet (or Foxtel) as we added a lead-in as an electrical upgrade. The white one looks suspiciously like a Cat5/6 or six strand phone connection. So, do I have a phone line connected - can I just call TPG, iinet etc and get a naked ADSL connection established? How can you tell - comments please! And before you ask - we haven't had a landline phone in 5 years, so I don't even have a phone to plug into these internal phone sockets! Looks like you have a telephone cable going to the street but it hasn't been connected to the internal cabling. Talk to your data cabling people and then apply for a connection with TPG or whoever you wish to connect with. Telstra cable could be a shot as well with the newer much lower pricing. Congrats on being in- we got plaster today so hoping things move along a bit quicker now. I am under the impression that with new sites that you have to either go through Telstra for the phone line to get the connection. If you get the phone connected through them it is around $300 but a bit more if you choose to go through someone else. Might not be the case for you as you had a house there but with our house that is the info we have been given. You might have to dig a trench out to the street so that telstra can connect to the house... think we have to do that also. Good luck ! House looking good. I live a few streets away from you in Box Hill North. We are also about to demolish our weatherboard and build with Metricon. Perhaps i will do a blog :). We are building a pair of Elwood duplex ( assuming the council gives permission) Just about to sign preliminary contracts this week. Your blog has been most helpful mate. Tell me, that back sliding door onto the patio, is that what is known as the 'bi-part' timber[SG-DOO-ODL-157] door? I am not sure if things are the same where you are but when our builder was finished we had a cat5 cable sticking out of the external wall near our meterbox. We also had a white conduit running from that point to the fenceline which was done by the builder when our power pole was installed. This meant that our house wasnt connected to the telstra copper that runs along the street. I also found out that to get an ADSL connection (Naked or otherwise) we also needed a working tesltra phone line. All up this translated to about $300 of cost to get our house connected to telstra copper and the line activated, in the process the telstra guys installed a little grey box on the side of our hosue like what you ahve in your photo. It seemed somewhat pointless at the time as the very next day I submitted a naked ADSL2 application which ultimately removed the phone service from the line! We are looking a building the Elwood Duplex as well. Would love to chat to you about your experience so far. Tim and Tina's first video blog!